North America’s favourite aviator watch brand is cleaning up its collection – and its image. This was Kerns’ opening salvo on the New York leg of his “Legendary Future” roadshow, with previous stops in Shanghai and Zurich. 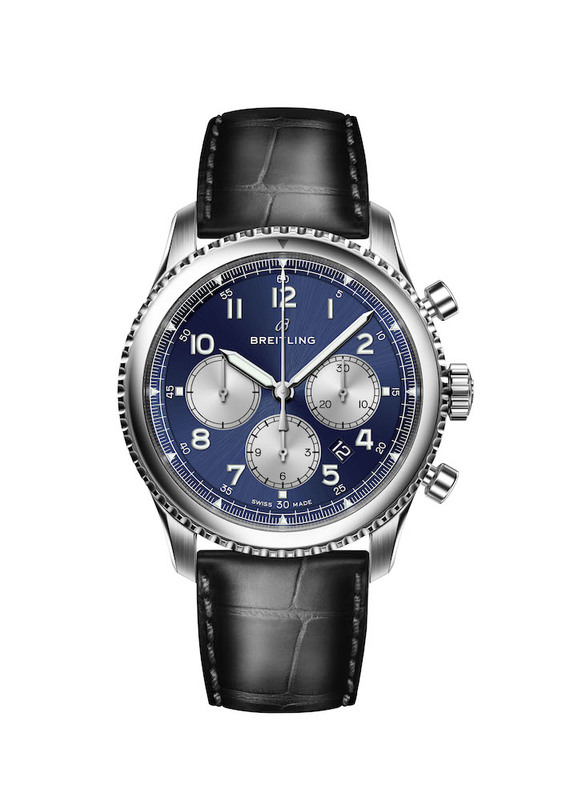 The goal was to unveil Breitling’s new collection and design language. Going forward, new models will be pared down, cleaned up and categorized into one of three sports-related realms: land, sea, or air. Aviation watches are still part of the collection, but will share equal space with sports-inspired models from the land and sea, including motorbike-themed pieces. Breitling has just kicked off a partnership with Norton Motorcycles and dive watches. Breitling’s biggest seller is the Superocean Heritage II, reintroduced this year in a smaller case with an upgraded, in-house movement that comes with a five-year warranty (the industry standard is two). “Nobody does that quality/price ratio,” says Kern. The price range of the Breitling collection is $4,000 to $9,000. To help revamp the collection, he brought in Guy Bove, who, as creative director at Chopard for the past ten years, was instrumental in launching that company’s L.U.C. collection of premium watches with in-house movements. Before that, he worked for Kern for six years at IWC, a higher-end, yet less-visible sports watch brand owned by the Richemont Group. Bove’s brief was to update Breitling’s line to include cleaner, more contemporary designs, but to take inspiration from the archives (Breitling was founded in 1884, so the archives are extensive). “The idea is not to remake old watches again,” says Bove, who is as weary as most watch fans of the chronic lineup of vintage reproductions from heritage brands over the past couple of years. “I see it more as taking raw ingredients from older models and using them in new recipes.” Not all of those ingredients will make the cut. Fans were shocked, for example, when Breitling introduced a new Navitimer, its signature pilot’s watch, without the slide rule, a defining feature since the 1950s. It wasn’t that the slide rule was deemed out of date; in fact, it was too modern. The new design was inspired by on-board chronographs produced by Breitling in the 1930s and 1940s, an era before slide rules. “It’s a tool watch inspired by pilots flying small dangerous planes who did not have the time to use a slide rule but who needed a simpler dial to see the time at a glance, versus the newer Navitimer models, which were useful to pilots planning routes and doing calculations,” says Bove. The new model, the Navitimer 8, is named for Breitling’s Huit Aviation Department, set up by the company in 1938 to produce cockpit instruments. Huit referred, at the time, to the eight-day power reserve of the on-board instrumentation.